This is another of our own Yorkshire grown products with carefully researched design, correct specification metallurgy on all components, selective carburising (heat treatment), polished bearing tracks and absolute precision machining by CNC machinists to the Formula One circle.. 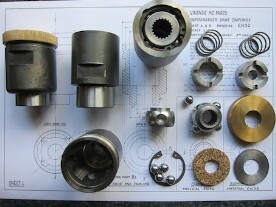 This is a drive assembly with a difference and is not being made available to the MMM parts distribution trade. We have noted the shortfalls of competing MMM couplings and a claim that these are adopting the 'original pattern units'. This is simply not the case and having carefully studied the original MG Car Company works drawings, the retaining cap for example was never cross knurled and neither was it made of aluminium. Original pattern MG design was coarse straight knurling and was machined from brass. One of the problems with the 'original pattern' was, and still is, the issue of trying to torque up the coupling retaining nuts without having the coupling housings rotating and with nothing to assist in preventing this. Therefore, VMGP coupling housings (both ends) now incorporate a pair of 'spanner flats' machined into the body which for us, seems a logical common sense approach. For the blower drive coupling itself, we have carefully positioned the flats so as not to interfere with blower gear housing oil seal arrangements, whether these be on the reduced or full diameter areas of the body. The added advantage of our 'spanner flats' is that if necessary, these can also be utilised as anchor points if an extractor tool is necessary for any tight fitting couplings depending on the source of MMM reproduction crank being utilised. Our drive aperture in the crankshaft coupling is however, correctly bored to the tho for correct tolerance fit to a standard specification MMM crank. The crank nose coupling is bored with keyway and the nut is already threaded for the standard MMM crank. They are prepared for immediate application to the J Type crank and can be also be used for P, N, L, Q and K Type application through sliding a spacer washer onto the crank. For the blower coupling, the drive shaft bore and nut is left undersize for enthusiasts to have finish machined to suit their choice of blower. 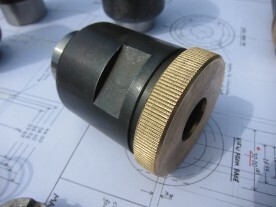 We can undertake all necessary machining for a Volumex application to include finishing boring of the blower coupling housing and cutting a keyway, countersinking the housing rear face and threading the castle nut, all within 24 to 48 hours of receiving an order. We are aware that a competing product is being offered for sale for Volumex use although incorporates a seal diameter which will not work for this application without further modification. In addition, no other MMM parts retailer of a similar product is in a position to compete with us on price for this Volumex adaptation work. With reference to drive shafts, we re-affirm comments recently made by Sports and Vintage regarding an alternative supply of Blower Drive Couplings which 'may have an identifiable weakness in design'. We are also aware of shafts being offered which do not incorporate sacrificial waisting; shafts should incorporate a sarcificial break point in the unlikely event of catastrophic failure of the blower. In this instance, the shaft must break to avoid irrepairable damage being inflicted on the blower or the engine. We have adopted the original factory design with a sacrificial waiste. Our shafts are also made from EN24T grade steel and we have a 100% track record with no shafts failing, so we know we have our material and design specification absolutely correct. If plain shafts are being offered then the enthusiasts will use at their own risk in the event of a catastrophe.